Anticipation runs high in our angling community as this change in season turns attention to our local rivers for fly fishing.With the first golds of an approaching autumn come the first runs of bright silver rainbows. Wading a Lake Taupo river on a clear frosty dawn, pampas grass bowing heavy with dew while a bright sunlight dances on a rivers rappids is unforgettable. Combine this with the explosive take of a freshrun rainbow trout and you have the true essence of an unforgettable New Zealand fishing experience . Welcome to Taupo in autumn. # 6-7 weight rod & line ideal. Nymphs weighted in sizes # 10 &12's, small nymphs # 14's & 16's. Breathable waders as in summer are ideal, polyprops for warmth advisable. Fishing in NZ & the Lake Taupo region along with its many moods is perhaps best portrayed in the winter months. Riverside scenes may reflect bare willows on a clear frosty dawn in June or rain swept with mist enveloping the pines in August. Waist deep in a river's flow, wrapped up against the elements while a wild six pound rainbow leaps in defiance, stripping line to the backing is a truly magic experience. 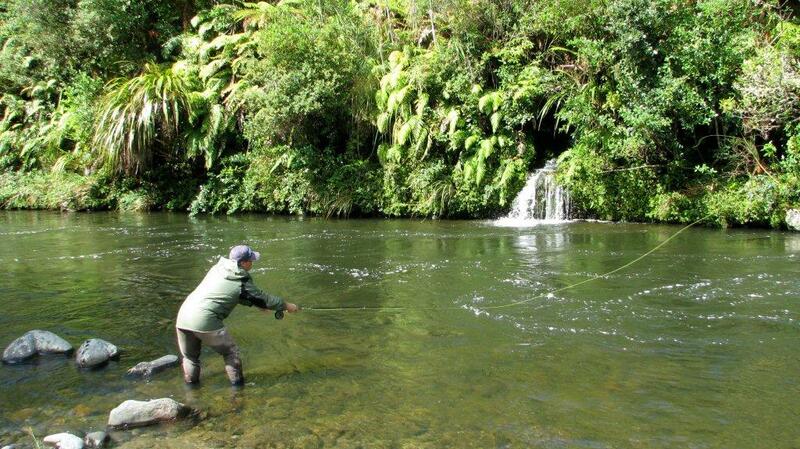 This is Taupo in Winter, Peter Wilton fly fishing guide can help provide this memorable experience. Spawning runs in our Taupo rivers like the Tongariro reach their peak over the winter months. This internationally renowned river is both majestic and exhilarating to fly fish on any Taupo visit. If more gentle meandering trout streams are your choice then there are rivers to suit. The Tauranga-Taupo River is open and easily waded, the Hinemaiaia Stream ( a favourite ) runs through a sunlite gorge while the spring-fed Waitahanui has an itimate charm all of its own. # 6 to # 8 weight rod and floating line best, depending on size of water fished. Nymphs #10's to #14's (weighted). Neophrem or breathable waders suitable, bring polyprops for warmth. 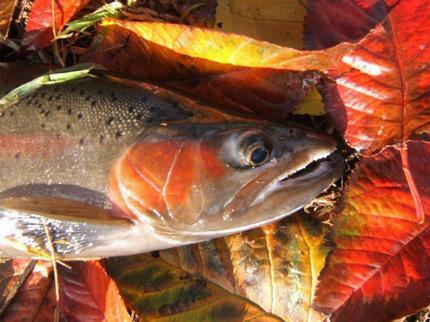 Spawning runs can vary on each of our rivers, most runs peaking Aug, through to end of Oct.